Meanwhile the polarization of class and political forces accelerated. The war went on, the elections to the Constituent Assembly were being postponed, the industrial dislocation and food crisis deepened. The end of the summer of 1917 was marked by the growing wave of political strikes in the cities, illegal land seizures in the countryside, nationalist unrest on the fringes of the empire and mass desertions and fraternization with the enemy at the front. In these conditions all attempts of the Provisional Government to steer Russia towards democracy, completely unknown to her people before February 1917, were encountering mounting resistance both from the Left and from the Right. From the Right, the biggest threat to the Provisional Government came at the end of August when General Lavr Kornilov (1870-1918), the new commander-in-chief of the Russian army appointed to this position in mid-July, attempted to launch a military coup. By that time the increasing number of representatives of the right-wing political forces, including landowners, army officers and entrepreneurs, were tired of the weakness of the Provisional Government, its inability to stem the tide of ‘revolutionary anarchy’ both at the front and in the rear. The extreme Right advocated a strong government with dictatorial powers which would be capable of holding the Russian Empire together and prevent anarchy by crushing the leftist forces. They found in General Kornilov a willing candidate to impose a military dictatorship. 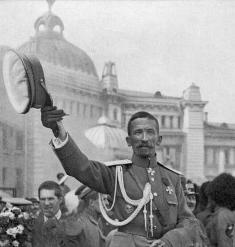 Late in August Kornilov ordered several cavalry units to march on Petrograd, apparently with the aim of crushing the Petrograd Soviet. A counter-revolutionary military dictatorship seemed to be in the offing. But at this moment of crisis the Provisional Government received powerful support of the revolutionary forces led by the Bolsheviks, which stopped Kornilov’s troops on their march to Petrograd and scattered them before they could reach the capital. The Kornilov affair was a crucial event both in strengthening the influence of the Bolsheviks and in crippling Kerensky’s government. The embattled Provisional Government had been forced to appeal for Bolshevik support to help defeat Kornilov. It felt now obliged to release imprisoned left-wing socialist leaders and arrest some right-wing politicians. Kerensky found himself and his government trapped in the ‘no enemies on the Left’ syndrome which tied his hands. By September the Provisional Government had no active support from any large section of society. By trying to satisfy all, it had alienated both its upper-class supporters whose propertied interests it could no longer protect, and the working-class Russians who had waited in vain for the Provisional Government to resolve such key issues as war, land, the food crisis and the Constituent Assembly. Nor did it have the firm control over the coercive machinery of state needed to impose its will by force. Delivering the lethal blow proved all too easy.